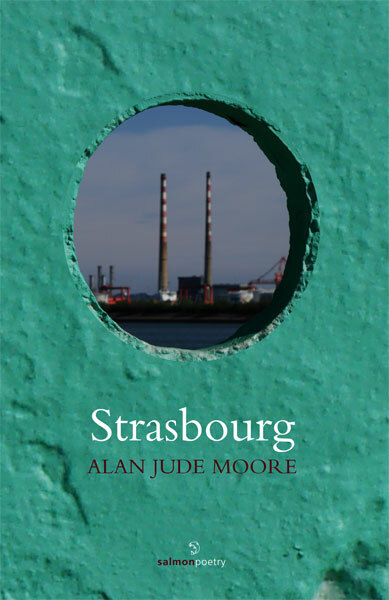 With this new work, Alan Jude Moore marks a return to Dublin after the Russian poems of Lost Republics. This book, Moore’s third collection, is about Dublin but also by extension it is about Europe and the citizen, about how we are more united by its expanse, by our common interests, needs and histories than we are divided by its nations and borders. That the small Alsatian city of the title, Strasbourg, is one of our capitals reflects a wider cultural identity Ireland is part of, not tied to the narrow nationalism and theocracy that have constrained its development for close to a century. It is about how, through the cities and centres of Europe, through the influx and movement of people, information and ideas, we are constantly changing and developing, through empires and republics, as citizens and collectives. As the territories we live in seek to renew themselves, it is by this common ground that we might discover where to go from here. Alan Jude Moore is from Dublin. His two previous collections of poetry, Black State Cars (2004) & Lost Republics (2008), are also published by Salmon. He is widely published, in Ireland and abroad, and his fiction has been twice short-listed for the Hennessy Literary Award for New Irish Writing. Translations of his work have been published in Italy, Russia and Turkey. He lives in Dublin. like pearls of steam on a mirror.